Charlotte is a Top Cookie CEO for the Girl Scouts. Charlotte's mother works in marketing. Jason Momoa is an actor who has topped the list of "100 Most Handsome Men." Put all three together, and you have "Momoas", now available in Colorado. HIGHLANDS RANCH, Colo. — It's the most wonderful time of the year! No, not talking about Christmas - it's Girl Scout cookie season. If you didn't know, competition between Scouts can be tough in these Colorado streets. So one fifth grader from Highlands Ranch is pulling out all the stops. Charlotte is hoping to keep that title by bringing "Momoas" to life. You may have seen a picture of the cookies on social media before. 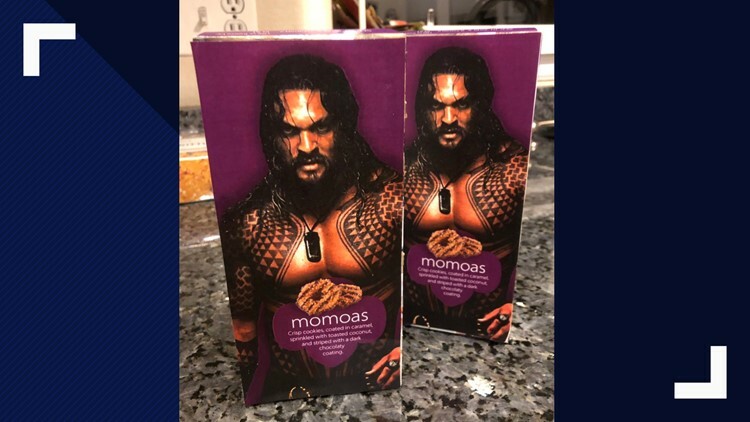 They are a play on actor Jason Momoa's name and the Girl Scouts' "Samoas" cookies. You know which ones we're talking about: the caramel-coconut pieces of heaven that ruin all of our diets. Charlotte's mother saw the picture on Facebook, which features a shirtless picture of Momoa. As a marketing professional, she knows a thing or two about the business, so her and Charlotte got to work printing out the pictures and gluing them on dozens of boxes of Girl Scout cookies. They put it on Facebook, and you can guess what happened next. "The moms are getting really excited and they're saying that they need them," Charlotte said. Even other Girl Scouts are hitting up Charlotte, asking to buy some. Now you know why they call her the Top Cookie CEO. They say Thin Mints are the most popular Girl Scout cookie. That might now be a thing of the past. Hot tip: Charlotte will be at Nordstrom Rack in Cherry Creek Saturday, Feb. 16, selling "Momoas."